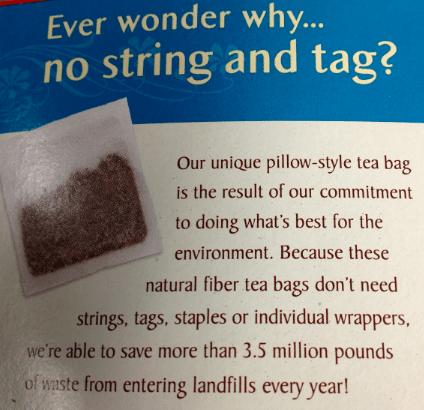 Napkin Math: How Much Waste Does Celestial Seasonings Save? It seemed hard to believe that they really save 3.5 million pounds of waste just by not including that extra packaging, so I decided to do some back-of-the-napkin math. How much paper is in each package of non-Celestial-Seasonings tea? The little bag is about 2 inches by 2 inches, it’s two-sided, and there’s a tag, staple, and string. Call it 10 square inches. How heavy is the paper? It feels about the same weight as normal copy paper. Amazon.com lists a box of 5000 sheets of standard letter-sized paper at a shipping weight of 50 pounds (including the cardboard box, but we’ll ignore that). Pretend that each sheet (8.5 * 11 inches = 93.5 square inches) is about 100 square inches. That’s .0001 pounds per square inch. How much tea does Celestial Seasonings sell every year? Wikipedia says their sales in the US are over $100M, and they are a subsidiary of Hain Celestial, which has a lot of other large brands. Hain’s sales last year were just under $500M. $100M is a good enough ballpark number. Each box of 20 tea bags sells at about $3.20 on their website, and I think it’s cheaper at my grocery store. Call it $3.00 per box, so we’ll estimate the volume of tea bags on the high side (to make up for the low-side estimate caused by pretending there’s 100 square inches per sheet of paper). That means they sell about 33.3M boxes, or 667M bags, of tea each year. If they put bags, tags, and strings on all of them, I estimated 10 square inches of paper per bag, so at .0001 pound per square inch that’s .001 pound of extra paper and stuff per bag. That means they’d use about 667 thousand pounds of paper to bag up all that tea. That’s quite a difference from the 3.5 million pounds of waste they claim they save. Did I do the math wrong or assume something wrong? Update: I have a scale with a precision of 1/10th gram. I weighed an unopened box of Celestial Seasonings tea. The box of 20 bags, net weight 48g, weighs 86.3g gross. For comparison, I weighed a similar box of tea with 20 individually wrapped bags, net weight 45g; it weighs 82g. In other words, at best Celestial Seasonings’ packaging saves virtually no weight compared to run-of-the-mill tea. As I suspected.